Hello lovely readers. Welcome to this weeks Read With Me. With the kids back at school I was happy to have a few free moments to catch up on a bit of reading. 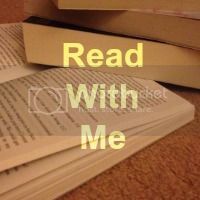 I have a couple of favourite blogs to read to get some great book recommendations so I thought I would mention them on here. They keep me up to date on new releases, books on sale and those freebie kindle purchases!! Thanks as always to everyone who linked up last week. One of my favourites was from Sarah over on Let Them Be Small. She was sent a lovely collection of books from Usborne. I've always been fans of their range, a good selection for children on all ages. Now on to this weeks link up. Anyone new, you can look here to see just what this linky is all about. All you regulars know what to do. Link up, comment and if you're feeling nice you can display my badge or link back.